An extremely straightforward app by Mass Creation Sp. 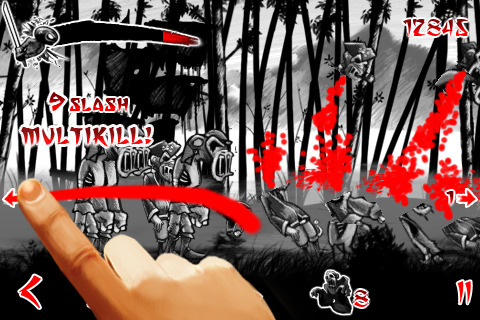 Z. o. o., Draw Slasher: Dark Ninja vs Pirate Monkey Zombies is an iPhone game in the App Store that can be described with no other word than “simple.” If you have 99 cents lying around and want an uncomplicated game to play for a few minutes, try Draw Slaher. But beware, paying that 99 cents for Draw Slasher feels like buying a demo. The concept of the game is very simple, you control a ninja, and you run around slashing up any zombie monkey that appears before you. Using the slash motion on the iPhone, you draw indicators telling your character where to cut and move. You also have a left and right but on the left side that to me, feels obsolete because you can move with your slashes. The game uses a lot of black and white. And when I say a lot of black and white, I mean the only other color you will see is the red blood everywhere. Even though the amount of black and white is overwhelming, it fits the feel of the game so it isn’t that bad. I’m not really the type that looks for a double rainbow in all the games I play, so this didn’t bother me much. Plus the limited color suited the feel and genre of Draw Slasher quite well. Some of the cons I found really annoying is the different game selections in the menu. I mean yea, the game only cost 99 cents, but every other option I click tells me to pay another 99 cents for an expansion. Feels like I just bought myself into a pyramid scam. 99 cents may sound low, but for the value of game play you get, it just doesn’t feel worth it. Besides the double rainbow or the constant need for you to have an expansion to play this game, there isn’t much left to say. The game is very small and the three game types it does allow you to play feel the same and recycled. It’s too bad there isn’t a free version in the app store, unless I’d recommend anyone to try that first. But assuming how little you are given to begin with, there’s no possible way you can get less from a free version. 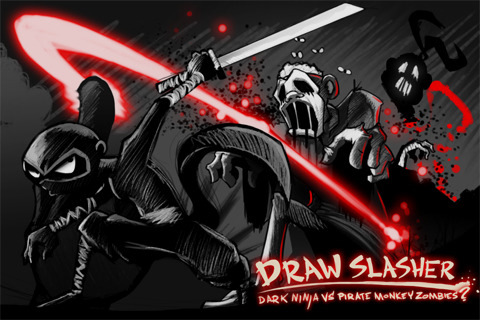 AppSafari review of Draw Slasher was written by Vincent Tam on March 8th, 2011 and categorized under Action, App Store, Arcade, Fighter, Games, Line Drawing. Page viewed 3979 times, 1 so far today. Need help on using these apps? Please read the Help Page.